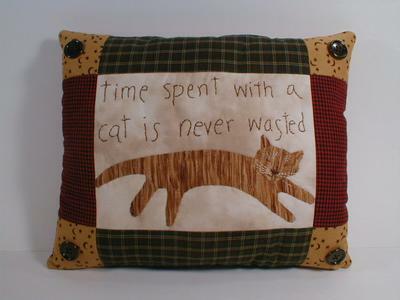 I have designed and created a line of whimsical, folk art theme pillows and have introduced them on Facebook - If you're on Facebook, type in search "The Work of My Heart Quilts". Two of my pillows feature cats. 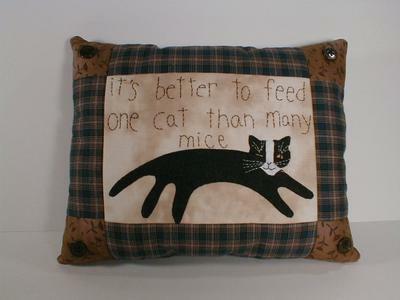 The sayings "It's better to feed one cat than many mice" and "Time spent with a cat is never wasted" are hand embroidered and the cats are hand stitched applique. The pillows are 11"x 13" and the price is $32 each. PA residents add 6% sales tax plus $5 for shipping. I have other designs available as well. Remember, you don't have to wait until the day after Thanksgiving to "buy local." My pillows are designed and made right here in Stewartstown, PA, USA! My pillows are also on Etsy under the name "The Work of My Heart."